Ground Floor: Entrance hall. Twin bedroom. Double bedroom with en-suite bathroom, and French doors to garden. Shower room. Walk-in dressing room. Open-plan sitting/dining room (TV, DVD, in-built wood burning stove, WiFi) with patio doors to garden. Kitchen (oven, microwave, dishwasher). Outside: Enclosed garden of lawns, covered and open terraces. Covered outdoor dining area. Barbecue. Laundry room (washing machine). Private parking. Shaped private swimming pool (6.5m x 3.25m at widest points). Here we have that winning combination of features so sought after by families seeking a comfortable and attractive holiday base from which to explore this gorgeous slice of coastline: an immaculately kept villa with pretty garden and private pool only a 10 minute drive from beautiful, sandy beaches and just 2.5km from one of the area’s most fascinating medieval towns. Adding further to the appeal, a pastel palette of Mediterranean colours adorns the interior of this charming abode whilst timber beamed ceilings, terracotta glazed floor tiles and the sweetest of kitchens are all complimented by stylish, smart interior furnishings. One can quickly sense that much time and effort has been invested to make this an easy property in which to quickly feel at home. Appealing as the interior is, most of your time will no doubt be spent outside since the south west facing garden enjoys a shaped swimming pool, thoughtfully positioned in a sunny location, and just a few steps away from the spacious covered dining terrace that provides ideal shade for a midday barbecue. Whilst the children splash about in the refreshing water, those looking to improve their tan will surely appreciate the protected sun terrace that lies adjacent to the lawn. 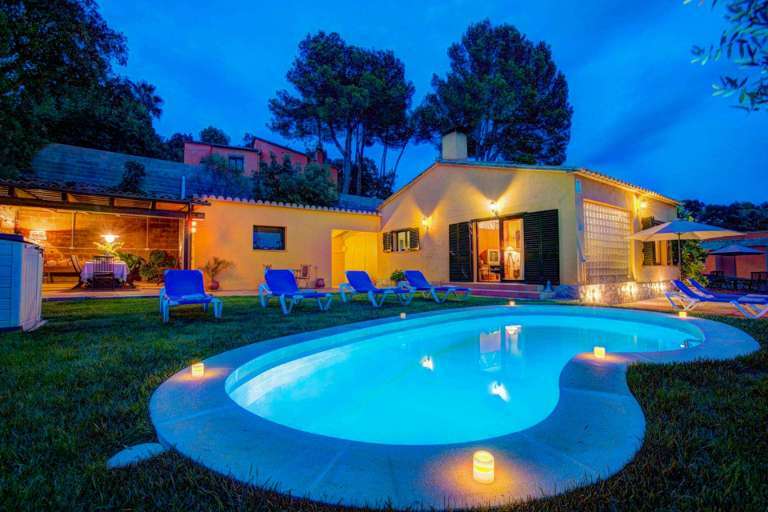 At Villa Nuria you are perfectly positioned to explore the delightful coves and fishing villages dotted along this spectacular coastline such as Aigua Blava (5.6km), Sa Riera (5.5km), Sa Tuna (8km) and no holiday would be complete without an evening stroll around the enchanting ancient town of Begur (2.5km) with its floodlit castle, chic boutiques, tapas bars and fine restaurants, the perfect place to sample the gastronomy of Catalunya and round off a magical holiday. the design of which has been influenced by the young people of Begur who emigrated to the Americas, mainly in search of riches. Those who returned left their stamp on the architecture of the town - one such example overlooks the small car park area near the church. From Begur to the inland medieval village of Pals, which has delightful views up and down the coast. There are some great restaurants in which to enjoy some sustenance before the walk back! there are excellent opportunities awaiting in the little coves of Malaret and Port de ses Orats at Aigua Blava. Legend says that Port de ses Orats is the very place from which the coastline was christened with the name The Costa Brava. Fun for all of the family in this forestry adventure park. There are 50 different activities ranging from jungle jumps, nets, bridges, zip wires, tree-hiking and more than 300 m of aerial runways. Situated in Camí del Bernegar, Masos de Pals. Tel: (00 34) 972 113 443. www.costabravaparcaventura.com. Open all year round and in July and August it is open on Wednesday nights from 10pm until 1am. the name of this delightful village is derived from ‘pedra tallada’, meaning carved stone. The moat which encircles parts of this fortified medieval settlement provides the stone from which most of the ancient buildings are constructed. As you stroll around, take note of the many properties which have been lovingly restored to their former glory. Take a walk around the City walls of Girona. Start at the end near the Church of Sant Feliu. You can stop at various points if you wish to descend. There are some spectacular views of the city of Girona and to the Pyrenees beyond. Also, visit The Jewish Quarter (El Call), which is one of the best preserved Jewish ghettos in Europe. The Jews lived here for over 600 years before they were forced out in the 15th Century by the Spanish Monarchy. You get a real feeling of its colourful history as you stroll around the narrow alleys. 120 latterly the home of the painter’s wife. On display inside are the paintings and drawings that Salvador Dalí gave to Gala, along with a collection of her haute couture dresses. The garden is decorated with a series of sculptures and elephants! Open daily, from June to September, from 10.00 to 18.00, but closed on Mondays outside of these dates. Tel: (00 34) 972 488 655. Hipica Begur (tel 619 23 60 73) also offer night excursions, carriage rides and for those who do not wish to take to horseback, Kart Cross excursions can be taken from here. situated along the front of Port bo beach in Calella de Palafrugell. Enjoy a drink or evening meal at one of the seafront restaurants and watch the twinkling lights of the fishing boats out in the bay and the spectacle of the brightly lit cruise ships gliding silently across the horizon. between the bays of Aigua Freda and Sa Riera. From the coastal path there are some ideal spots for fantastic snorkelling. which is the provincial capital of the Garrotxa and has some beautifully restored buildings as well as the famous Romanesque bridge, which was built in the 12th Century but restored in 1965.